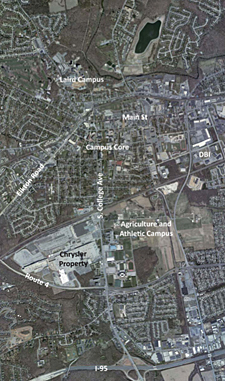 12:01 p.m., Nov. 23, 2009----After nearly 20 months of discussions and negotiations, the University of Delaware officially acquired the 272-acre site formerly occupied by the Chrysler Assembly Plant in Newark, UD President Patrick Harker announced today. "The state was a proud partner in the University's effort to assume ownership of the former Chrysler plant. One of the keys to our state's long-term economic recovery must be our ability to come together and respond quickly to economic development opportunities like this and Fisker Automotive at the former GM plant," Markell said. "The road to economic recovery may not be a short one, but we are moving forward together on it. This transfer makes it possible for the University to put people to work on a site that could eventually expand Delaware's reputation as a center for innovation and excellence." The site presents a variety of unique advantages and opportunities including its physical location within the mid-Atlantic region, access to transportation systems --both rail and road -- and its proximity to University programs, technical support and intellectual resources. The University's preliminary analysis suggests likely candidates for early inclusion on this campus are UD's emerging research partnerships with the Army, the Delaware Health Sciences Alliance, and several University research centers and institutes. The decommissioning process was commenced before closing and will be completed shortly. Salvage and demolition operations will start sometime in the spring 2010. Companies or individuals interested in site work should visit the University's home page, where there is a button bottom right on Chrysler Site Work.